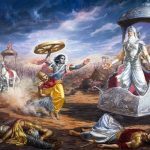 When Bhishma and the others on the side of Duryodhana blew their respective conchshells, there was no heart-breaking on the part of the Pandavas. Such occurrences are not mentioned, but in this particular verse it is mentioned that the hearts of the sons of Dhritarashtra were shattered by the sounds vibrated by the Pandavas’ party. 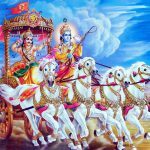 This is due to the Pandavas and their confidence in Lord Krishna. 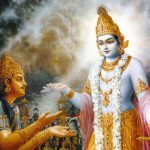 One who takes shelter of the Supreme Lord has nothing to fear, even in the midst of the greatest calamity. 1.1 – 1.19 Dhrtarastra said — Sanjaya said — Duryodhana, after viewing the forces of Pandavas protected by Bhima, and his own forces protected by Bhisma conveyed his views thus to Drona, his teacher, about the adequacy of Bhima’s forces for conquering the Kaurava forces and the inadequacy of his own forces for victory against the Pandava forces. He was grief-stricken within. Observing his (Duryodhana’s) despondecny, Bhisma, in order to cheer him, roared like a lion, and then blowing his conch, made his side sound their conchs and kettle-drums, which made an uproar as a sign of victory. 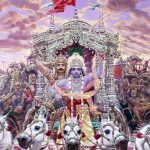 Then, having heard that great tumult, Arjuna and Sri Krsna the Lord of all lords, who was acting as the charioteer of Arjuna, sitting in their great chariot which was powerful enough to conquer the three worlds; blew their divine conchs Srimad Pancajanya and Devadatta. Then, both Yudhisthira and Bhima blew their respective conchs separately. That tumult rent asunder the hearts of your sons, led by Duryodhana. The sons of Dhrtarastra then thought, ‘Our cause is almost lost now itself.’ So said Sanjaya to Dhrtarastra who was longing for their victory. Sanjaya said to Dhrtarastra: Then, seeing the Kauravas, who were ready for battle, Arjuna, who had Hanuman, noted for his exploit of burning Lanka, as the emblem on his flag on his chariot, directed his charioteer Sri Krsna, the Supreme Lord-who is overcome by parental love for those who take shelter in Him who is the treasure-house of knowledge, power, lordship, energy, potency and splendour, whose sportive delight brings about the origin, sustentation and dissolution of the entire cosmos at His will, who is the Lord of the senses, who controls in all ways the senses inner and outer of all, superior and inferior — by saying, ‘Station my chariot in an appropriate place in order that I may see exactly my enemies who are eager for battle. The uproarious sound of the Pandavas conch shells being blown caused great fear to the sons of Dhritarastra. This is what this verse means. How? By its power, by its power it made the heavens and the earth resound, filling them all with its reverberations. Another source of fear for Duryodhana is indicated by the description of how the tumultuous blasts of the mighty warriors of the Pandava army sounding their conchshells shattered the hearts of Duryodhana’s army the Kauravas. Shattering the heart means the sound created excruciating pain within their hearts due to its volatile nature. How was this accomplished? By the violent force contained within the blasts which reverberating, filled the earth and the sky with echoes. 1.16 Sri Sankaracharya did not comment on this sloka. The commentary starts from 2.10. 12 — 1.29 Sri Abhinavgupta did not comment upon this sloka. 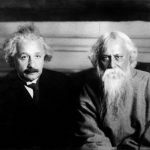 saḥ — that; ghoṣaḥ — vibration; dhārtarāṣṭrāṇām — of the sons of Dhṛtarāṣṭra; hṛdayāni — hearts; vyadārayat — shattered; nabhaḥ — the sky; ca — also; pṛthivīm — the surface of the earth; ca — also; eva — certainly; tumulaḥ — uproarious; abhyanunādayan — resounding.